Chelsea is a beach suburb 30 km south-east of central Melbourne. It is about midway between Mordialloc and Carrum, and its station on the railway line opened in 1907. The line (1882) had stations at Aspendale (1897) and Carrum (1892), and Chelsea’s urban growth was delayed by the absence of a station. Once opened, though, it became the main centre in the local council area, Carrum borough (1920), later Chelsea city. It appears that the place name came with the opening of the station, the Minister of Railways, Tommy Bent, being receptive to a suggestion by Bertha Black, a pioneer farmer, that the station be named after her mother’s birthplace, Chelsea, England: Chelsea denoted a shelly river (Thames) beach. A State primary school opened in 1912 and a Catholic primary school the next year. The State school began in the public hall, an elaborate ex-showground pavilion donated by the Headley confectioner family. It was known as the Joss House and served as a place of worship until various denominations built their own buildings. By the early 1920s the Joss House was demolished and replaced by a timber yard, by then a very necessary enterprise for home builders and do-it-yourself holiday shacks. The holiday shacks apparently attracted a risqué bohemian population, a suitable subject for Tivoli innuendo and headlines in Melbourne Truth. Carrum borough’s offices were in Chelsea along with the war memorial hall, the area’s leading Catholic church, the court house (1929, heritage-listed) and the largest local shopping centre. A later mark of importance was the Melbourne Centenary clock (1934) in Chelsea. 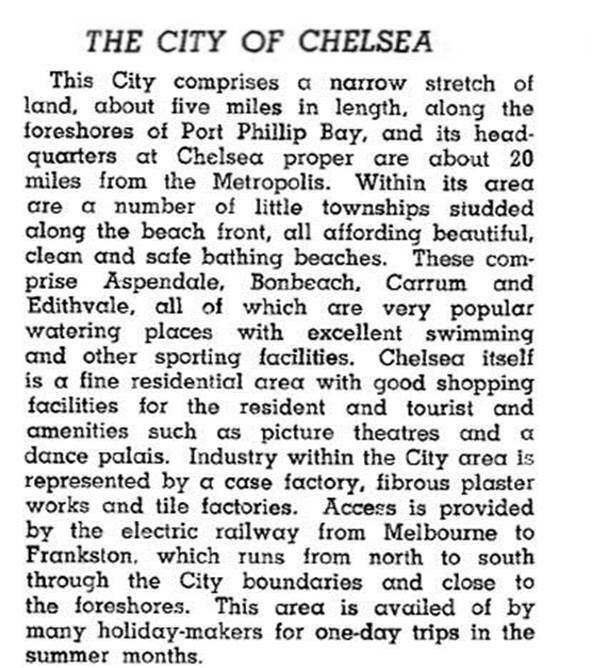 Chelsea city was disadvantaged by sub-standard holiday houses, unsewered in common with the rest of the municipality until 1965, and occasional floods from the Dandenong Creek until improvements were made upstream and at the outfall end. In 1951 the council engaged Alfred Niemann as its city engineer and building surveyor. He successfully tackled the flood problem and the unmade quagmire streets. Later that decade the council built infant welfare facilities. In the 1970s it opened elderly citizens’ clubs and a meals-on-wheels service. In 1973 the make-do borough office replaced by a city hall and a municipal library was opened. The self-service grocery was replaced by a Safeway supermarket in 1979. As a tribute to the engineer/surveyor, the Alfred Niemann hall was opened in Baxter Avenue. In 1994 Chelsea city was united with parts of Mordialloc, Oakleigh, Moorabbin and Springvale cities to form Kingston city. Chelsea (suburb) has a long beach overlooked by many houses in a herring-bone street layout between the sea and Point Nepean Road. Away from the beach, along Secondary Drain, there are extensive parklands, sports reserves and a pony club.